Marriott Rewards has been emailing select members over the past couple of days over the changes coming to the program this week. 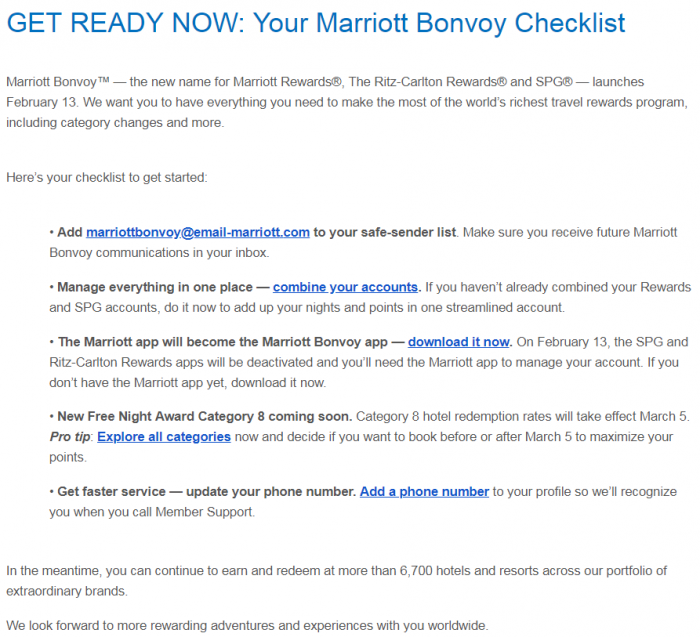 The subject line of the email is “Your Marriott Bonvoy Checklist Is Here”. I am not sure why they haven’t sent it to everyone because it clearly states that the award categories are changing on March 5? You can access Marriott’s page for the award changes here. The email very subtly on the top hints that there are changes to the award categories on March 5 but doesn’t explore this beyond category 8. Marriott on Friday released the list of changes to roughly 5% of hotels that are changing on number of points required for awards on that date (read more here). It would be wise to send these to everyone and to be clearer about the property moves on that date so that members could make informed decisions how to use their points.